In the US, 77.1% of the 4.8 million English Language Learners in public schools speak Spanish as their first language. Year over year, this population continues to grow and so do the math score gaps between native English speaking students and native Spanish speaking students. Prepare your district with strategies to support this growing population. 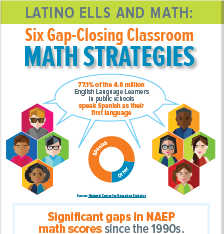 Download and share a free infographic to learn 6 new gap-closing classroom strategies. DreamBox Learning Math is available in both English and Spanish, so students can learn in the way that works best for them to deepen understanding and progress. Editorial Projects in Education, Inc., 6935 Arlington Road, Suite 100, Bethesda, MD 20814. Copyright © 2018 Editorial Projects in Education. Note the OER item below. Download free copies of whitepapers containing insights and thought leadership from our sponsors. To explore the rest of our sponsor’s whitepapers, visit the current collection here. The content of these whitepapers is from our sponsors and is not written by Education Week nor any of its affiliates. This message was intended for [mkbarbour@gmail.com]. You are receiving this e-mail because you registered on Education Week or Education Week Teacher. Note this e-learning company advertisement. We know pilot season can be overwhelming. From selecting a potential EdTech solution to test, to making a post-pilot decision, the process is complex. Take the complexity out of your district’s pilot process with the new EdTech Pilot Success Guide. This step-by-step framework will help ensure your team gets the most out of an Edtech pilot and is prepared to make smart district decisions. Download the free EdTech Pilot Success Guide now. From now until the end of the 2018-2019 school year, select Districts are invited to pilot DreamBox Learning Math. Signup today so that your district can receive unlimited access to the only K-8 digital math solution proven by third-party efficacy studies to positively impact outcomes. We can’t wait to hear how your DreamBox Learning pilot is going. Keep us up to date by tweeting @DreamBox_Learn. Note the whitepaper below on digital learning. Measuring growthAre you getting these 7 factors right? You are receiving this e-mail because you registered on Education Week or Education Week Teacher. The initial item in this report – the “big ideas” item – may be of interest to readers of this space. What’s on the horizon for education in 2019? Click to view this as a webpage. View 10 Big Ideas in Education, online now. What issues have the potential to define—or redefine—education? Is there a next “big thing” that could shift the K-12 experience or conversation? Education Week set out to answer these questions in this second annual “10 Big Ideas in Education” report. Accompanied by compelling illustrations and perspectives from leading researchers, advocates, and practitioners, the essays in this report are meant to stir conversation and prompt you to think about your work in a new way.Subscribe so you can read the full report, and get full access to everything on edweek.org. The widespread embrace of foreign-language instruction is raising some uncomfortable questions. Corey Mitchell explains the inclusion problem at the heart of bilingual education. Enjoy the complete reporting provided in 10 Big Ideas in Education. Subscribeto Education Week for more in-depth special reports and daily K-12 news. Enjoy unlimited digital access from every device when you subscribe today! Feel free to forward this to a colleague and let them know about this new special report.